Running a 100 miler had been a fantasy goal of mine ever since I had first heard of Western States back in 1978, but as I have mentioned before, it was not until Feb. 2002 at Holliday Lake that I finally ran my first ultra. I ran my 2nd ultra in 2003 at the Frosty 50K and it was soon after that race that I set my goal of running a 100 in the near future. I ran my first 50 miler in October of 2003 at Mountain Masochist, just barely making the cut-off in 11:55 and afterwards began training for Umstead. Leading up to MMTR I had only been averaging 25 miles per week so I felt I should try and increase that as much as I could. Over the next 6 months I would complete 3- 50k's and just three weeks before I ran in the inaugural Umstead Trail Marathon. So in the 6 months between MMTR and Umstead I increased my weekly average to a whopping 29.1 miles per week including the mileage in the races. 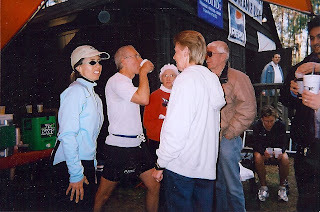 Although I had been a volunteer at Umstead since 1998, I had no desire to run the race there. The old course was all on rough gravel roads and I didn't even like to train on them, let alone take that kind of beating on my feet for that long. I only ran on the single-track when I went to the park. However when I saw how the park was re-surfacing the roads to make the bike and bridle trails I had changed my mind and was eager to run it. In 2004 the Turkey Creek trails still had not been opened so the course was a ten mile loop with about 2 miles still on gravel road but the rest on the bike and bridle trails. After MMTR a key component of my trainng was to go and do at least one loop a week on the course at exactly the pace I planned to use in the race. I would walk the hills and run the rest so that over time I knew every inch of the course and my body had adapted to the pacing. One day after doing my 10 mile loop I decided to walk another loop just to see how long it would take just in case I was unable to run late in the race. I thought it would also be good training since I would be using the walking muscles in the race. That 20 miles was the longest training run I did not counting the races previously mentioned. My first goal was to finish the race but I also was determined that I would try to run in under 24 hours. From the first time I had heard of the sport, finishing in one day had been considered a good time and I had always believed that I could someday run one under 24. Based on my inexperience and slow time at MMTR, all my friends and other ultrarunners I talked to tried to discourage me from trying. They thought I should concentrate on just finishing my 1st one and my projected time based on my 50 mile time would have been about 28-30 hours. However I was confident in myself and my plan and I would not be deterred from going for my goal. Hot Dawg!, YeeHaa!, Woohoo! Yeah Baby !! What a great experience for my first 100. We started at exactly 6am walking up a steep hill from the lake and then I fell into an easy running pace. Soon after hitting the B&B trail and a small incline I began walking. Jay Finkle said. "walking already" and I said yep, I've got a plan and I'm sticking to it. Soon afterwards I was running along with Mark Mintz, a local guy that I had met at the spaghetti dinner Friday night. He was running his first ultra, going for 50 miles for his 50th birthday. I explained my plan to him so he decided to stick with me . We would enjoy running about 33 miles together before he ran out of gas and said he was going to probably walk it in. So anyway, I had planned to cover the first lap in about 1:55 which was about the average of my training laps. I went through in 1:54 and was feeling great. I started eating then. My plan was to avoid sweets and gels and stick with solid food. This strategy would end up working well for me as my energy level stayed constant for most of the race until the last 7 or 8 miles and my stomach was in great shape almost the entire race. The aid stations are like a buffet and I ate a lot of turkey and cheese, potato soup, chicken and rice soup, baked potatoes, bananas, cracker and PB, and mid-afternoon, a couple of slices of pizza. The next few laps went very well and according to plan. I had estimated I would slow too and average 2:15 per lap the next 4 laps and getting to 50 miles in 11 hours. I hit 50 in 10:59, exactly on pace. The support from all the other runners, volunteers and race staff was terrific. Being that I am a local , I was cheered loudly everytime I came into the main aid station and it was certainly a big moral booster. Note:In the photo above, taken at 50 miles, some of my family are visible including my Mom and Dad. My oldest son and Daughter-in-law are just out of the picture. Notice Anita Finkle sitting in the chair with a sick stomach and contemplating dropping out. She would rise from the dead and with pacing support from Neal Jameson, eventually pass me and continue to a strong finish." I had figured the next few laps I would slow more to about 2:30 per lap and expected to have to walk more. I did slow but was still running just as much as I had in the early miles. Well the next two laps were almost exactly 2:30 each and I was still feeling better than I could have ever imagined. From mile 70 to 80 for the first time I began to feel tired when I reached mile 74 and realized I still had a marathon to go I had a little mental breakdown. I ended up slowing too much on that lap and lost 12 minutes off my pace. This started to worry me a little since I was still on sub- 24 pace but I knew I couldn't afford to slow anymore. So I went out on lap 9 on a mission. I would either pick up the pace or blow up trying. At least I would still have plenty of time to make the 30 hour cut-off. I couldn't believe how well that lap went. I felt great again and actually ran it faster than I had run since the 5th lap. As I came into the main aid station for the last time there were only a couple of volunteers around. Matt Kirk , a friend and the winner of the race in 15:05 was resting on the hood of a truck parked there and when he saw me he was so excited knowing that I was going to make my goal. He jumped up and said Joey, you're doing it man, a sub-24! He tried to get me to eat something but I was ready to get it over and for the first time my stomach wasn't too happy. I had been getting blisters on both forefeet but I didn't want to top and fix them either. I just wanted to get done. I gave my water bottle to Matt to fill while I made the last trip down to the lake and back. When I got back he forced me to at least eat something so I took some cheese and crackers from him and headed out. The last lap was the only time I finally had to dig deep, something I had figured I would be doing after the first 50 miles. the last lap was a struggle but mostly due to the blisters. My feet hurt so bad that running down the hills hurt worse than walking so I had to walk more just because of the pain. I was also finally getting sleepy but I never let my determination to go sub-24 waiver. And finally I could see the finish. I thanked the few people that were there including Matt who was waiting for me just down the hill. Here is a guy that had won the race 9 hours earlier and he was yelling to the timers, "it's Joey Anderson, sub-24 as he escorted me the final yards. What a fine example of the spirit of ultrarunning. Then I said to RD, Blake Norwood, "I'll take one of those 100 miles-One Day buckles please." Blake shook my hand and handed me my first ever buckle and then Sally Squier, the #1 Aid Station Captain and friend gave me a big hug and said, I knew you could do it. Excellent job, thanks for the report.